Foot fractures can be very disabling injuries, causing pain and significant loss of mobility. 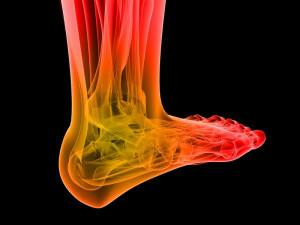 The foot is comprised of several bones and when fractured or broken can cause the person affected to experience a number of symptoms. There are five metatarsals within the foot, each highly susceptible to fracture among active adults and children. The first and fifth metatarsals are among the most common fractures. 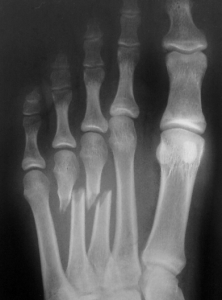 The third and fourth metatarsals (as seen in the image) do not typically require surgery unless there are significant displacements of the bone. A metatarsal fracture can either be an acute fracture or a stress fracture. The area can be fractured by sudden impact or via repetitive impact and pressure, which leads to stress fracture. For example, the fracture to the right could easily have occurred from someone dropping a heavy object at work, leading to a need for an Arizona Workers Compensation doctor. The typical treatment plan of a metatarsal fracture depends on the nature of the break and its location. The fractures seen here are minimally displaced and can be treated nonoperatively. Other symptoms of pain may result from wearing shoes that are too tight or become tight due to the swelling that occurs at the injury site. Symptoms may result immediately or within minutes or hours following the injury. If treatment is not sought right away, a broken toe may result in delayed complications. If the toe fracture heals inappropriately or without treatment, arthritis, stiffness or even deformity may develop. 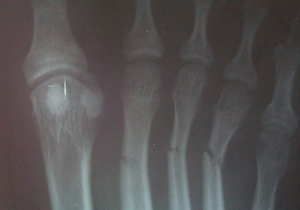 There are rare occasions that a fracture of the toe may not heal completely, giving rise to a malunion or nonunion. This condition can also cause further complications if the toe is not treated properly. If you experience an injury to foot, heel or toe, it is necessary to have the condition examined by a doctor. Careful assessment and x-rays can help identify the problem and relieve your symptoms of pain and discomfort.